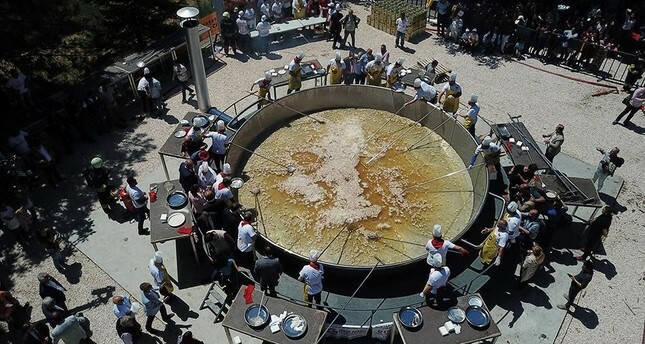 Turkish chefs on Saturday fried 600 kilos of lamb liver in the world's largest pan used for the meal in northwestern Edirne province to set a new Guinness World Record. As part of the 8th International Liver Foods and Bands festival, Edirne chefs, whose signature dish is fried liver, gathered around a 7-meter-long (275-inch) and 80-centimeter (31-inch) deep pan that weighs two tonnes in the province's Lozan street. Edirne Mayor Recep Gürkan and the city's famous chefs started their attempt to fry around 600 kilos (1322 pounds) of lamb liver under the careful watch of Guinness World Record's Turkey adjudicator Orhan Kural and other officials. Gürkan said the giant pan will be on display for tourists after the attempt is confirmed as a world record. The Thracian city of Edirne is famous for many things, including one of the best creations of legendary Ottoman architect Mimar Sinan, the Selimiye Mosque, and its delicious fried liver. Last year, local authorities launched a campaign to add the city's fried liver to UNESCO's World Cultural Heritage List.